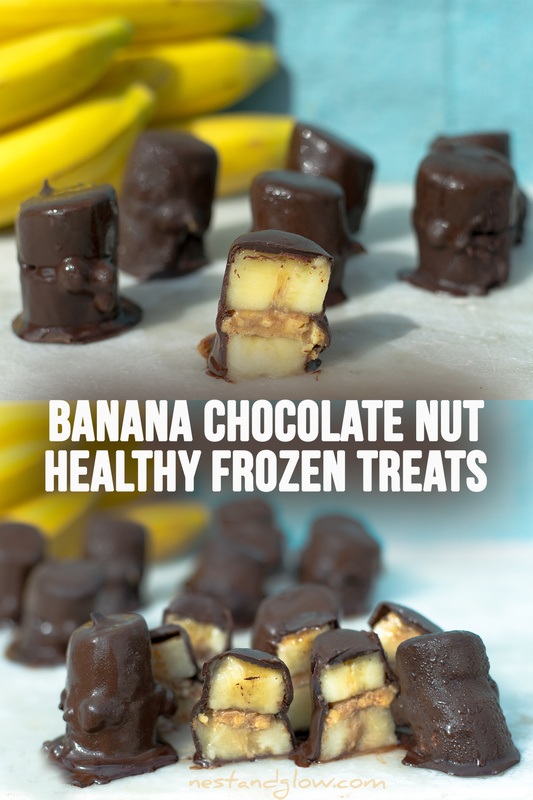 Healthy frozen treats made from bananas, chocolate and nuts. 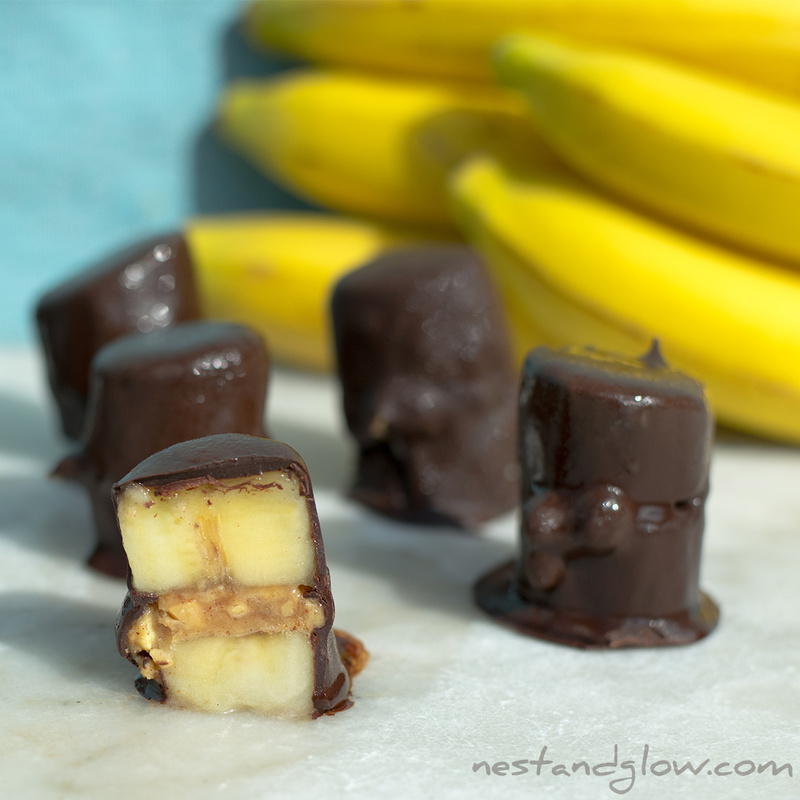 Banana slices are sandwiched between caramelised chunky nut butter and coated with a crisp layer of chocolate. This frozen snack recipe is a fun and easy way to make cold treats at home. This isn’t a low-calorie recipe but a no empty calorie dessert. It’s full of nutrition, protein and heart-healthy fats. These make a great filling treat and are perfect to have on hand in the freezer. 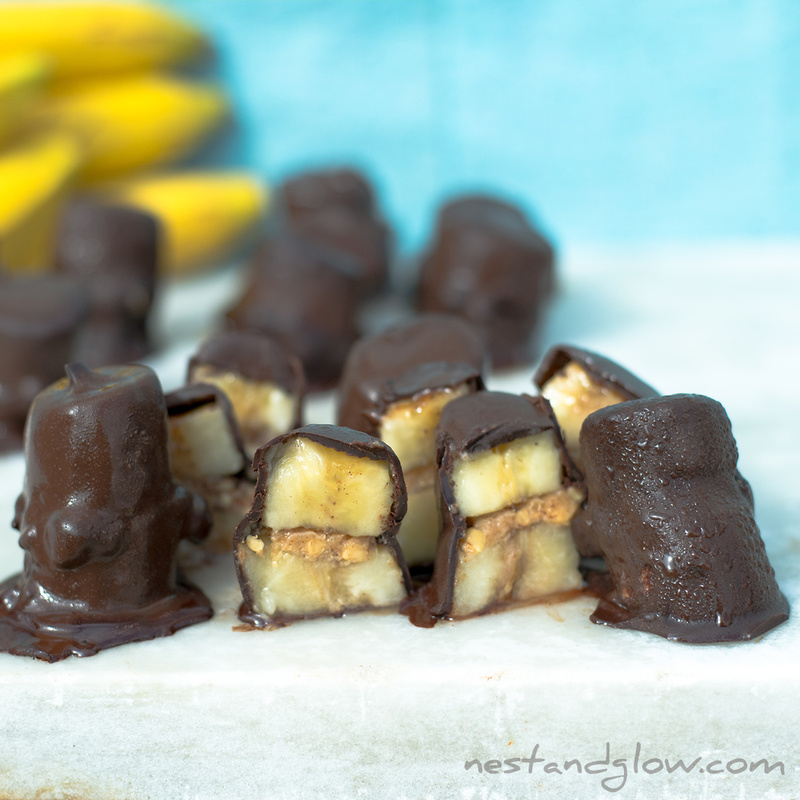 Think of these as banana snickers ice cream bites. A great recipe for all ages. Melt 3/4 the chocolate, remove from the heat stir in the remaining 1/4 to melt. This tempers the chocolate for the right snap and glossy finish. Mix the nut/seed butter with the sweetener. Cut each banana into about 8-10 coins. This works best with bananas that are just ripe. Spread the nut caramel onto a banana, top with another banana slice. 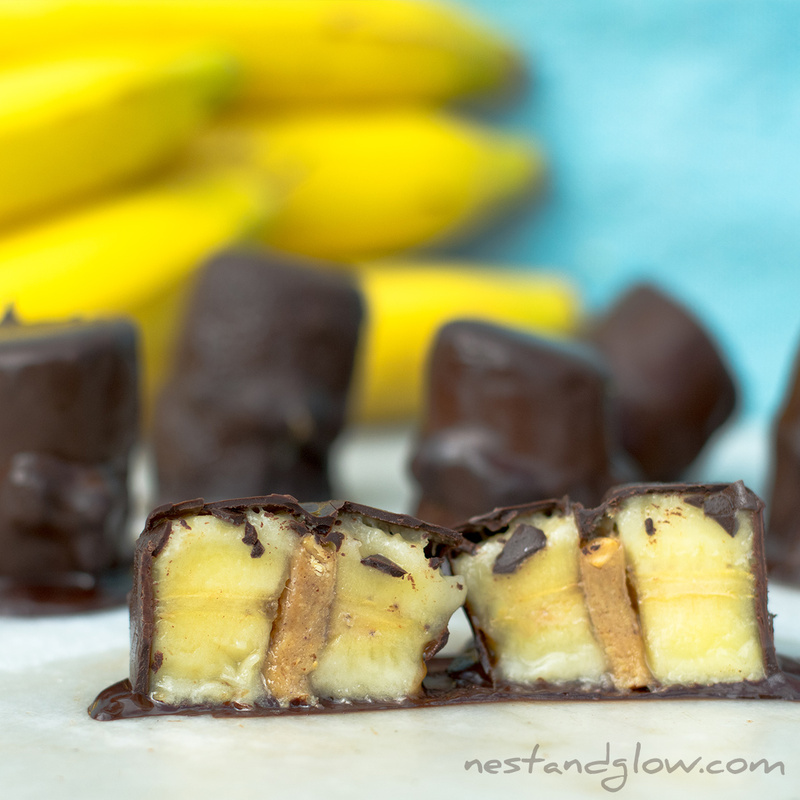 Hold the sandwiched banana slices on a fork over the chocolate and coat in a layer. Place on parchment paper and freeze for at least 2-3 hours. Can be frozen for longer – just take out 5 minutes to soften. Will last for at least a month in the freezer. View no music healthy chocolate treats video. Great recipe to be make in advance as they will last for weeks in the freezer. Banana once frozen and slightly thawed does have a great ice-cream like consistency. 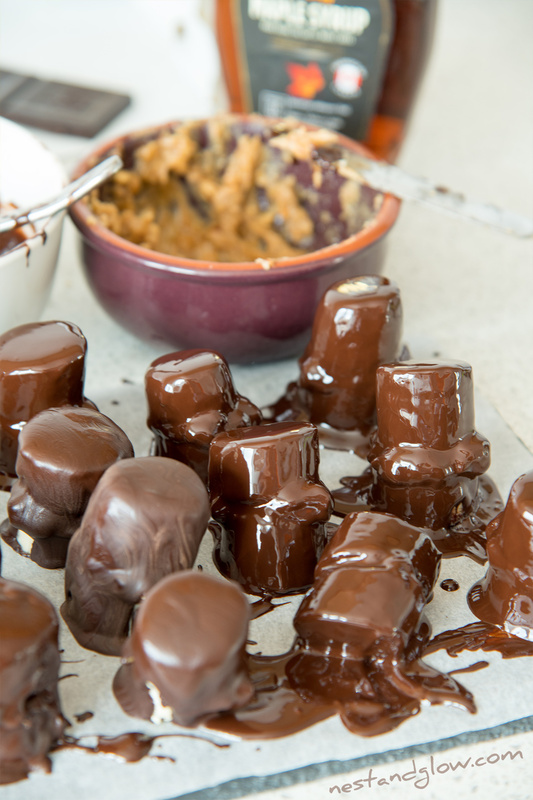 This recipe is perfect as it pairs dark bitter chocolate, with sweet banana and nut caramel. The photos and video for this recipe didn’t quite turn out how I wanted. This is a fun easy recipe – but manually focusing a camera while making it on all fours and then filming the final shots outside during a heatwave was a bit of a messy disaster. The marble was baking hot and melted the chocolate instantly making it very difficult to photograph. As the frozen treats were already melting there was no time to rearrange the shoot. I couldn’t even put them back in the freezer as the chocolate was melting and refreezing would lead to an ugly chocolate bloom! This is a great recipe that’s fun and easy to make – just not quite as fun to film. Take this as an idea of what to do – I’m sure everyone else will get better-looking ones. Mine still were great even if they aren’t pretty. 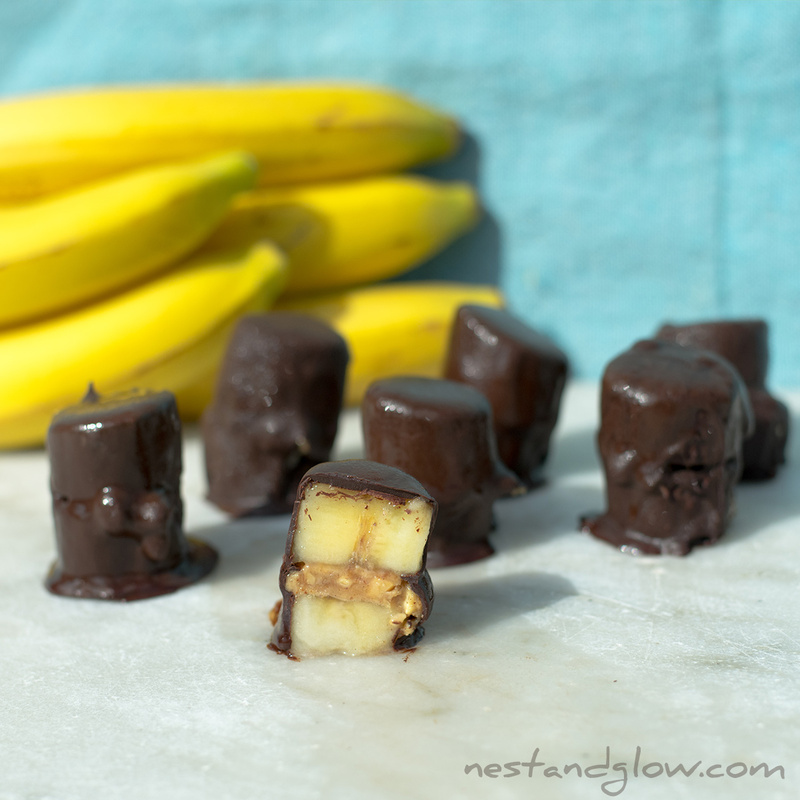 It’s hard to go wrong with chocolate, nut butter and banana! Use any nut or seed butter that you like for this. For the photos and video a peanut, cashew and pecan nut butter was used just because it was on offer and I wanted to try it. Would work just as well with a seed butter to make nut free or you could make your own sunflower seed filling. This is a fun messy recipe when you’re in that kind of mood. Was inspired by the chocolate banana coins in Trader Joes with the twist of sandwiching with nutty caramel. The nut butter is a great enhancement to these. It’s best to use a very dark chocolate with these as its low in sugar and high in healthy cacao. To get a thin coating pour the chocolate over the bananas as soon as it’s melted. For a thicker coating leave the chocolate for 5-10 mins after its melted then pour over. You may notice mine aren’t the neatest – with a bulging centre of nut caramel oozing out. I did try to make them look perfect but in retrospect I quite like the centre oozing out once covered in chocolate. You could do thinner banana slices for more coins. The method I use here gives 2-3 bites per coin but does make the recipe much quicker to do. To make this recipe a bit less messy you could freeze the bananas and nut butter caramel for an hour or two. I didn’t while filming this, to my detriment, as I’m impatient and all about quick and easy recipes. Doesn’t matter if some fall on their side while drying – they still look and taste just as great! If I was to photograph this another time I would make more of an effort to cut straight lines as they kept falling over while shooting finished recipe. Melted chocolate got everywhere as they were re-positioned. However when doing this to eat you just want to cut to make the most of the banana. Make this raw vegan by using raw nut or seed butter (raw activated almond butter recipe) and a raw chocolate coating with 1/3 raw cacao, 1/3 fat (like coconut butter or cacao butter) and 1/3 sweetener like date syrup. The method of melting 3/4 of the chocolate taking off the heat then melting the last 1/4 is for easy chocolate tempering. 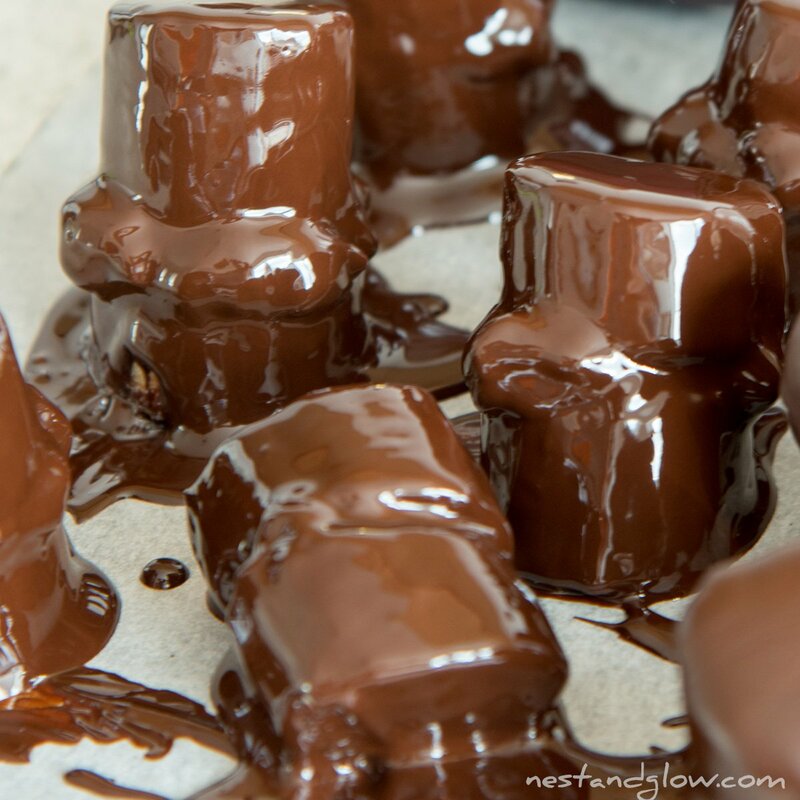 This gives the glossy shine without adding coconut oil and the perfect chocolate snap that you expect. Without correct tempering, the cacao butter separates and you get dull chocolate that doesn’t have a satisfying snap. If you like this recipe check out my healthy snickers ice cream bars made from cashew nuts and nut butter!